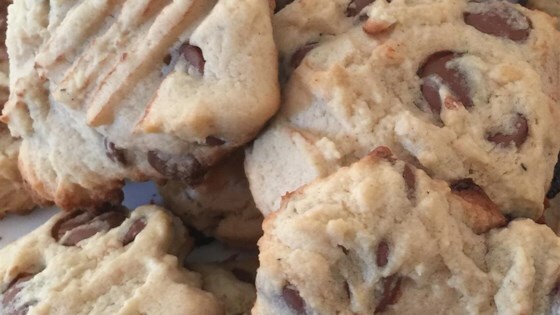 "This is a slightly healthier version of traditional chocolate chip cookies because margarine and cream cheese replace straight butter. They bake up moist and cake-like and have a delicious taste. I always gets rave reviews!" Preheat oven to 375 degrees F (190 degrees C). Grease cookie sheets with non-stick cooking spray (I use butter flavored) and set aside. Combine cream cheese, margarine, and sugars. Blend in egg and vanilla. Add dry ingredients and mix well. Add chocolate chips and mix. Bake 15-18 minutes or until edges are slightly browned. Enjoy! Chocolate chip cookies that are the best of both cookie worlds, crispy and chewy. The dough was really delicious but once baked, these cookies weren't that good. In fact, I would almost say they were gross. I made these for my Christmas baskets last year and they were a hit! I used real butter instead of margarine. You are not supposed to taste the cream cheese, it just makes them more fluffy.